The adventure begins with a series of rituals that few outsiders see. First, Balinese villagers invite you to join them as they complete finishing touches to their ogoh-ogoh, giant papier-maché figures of mythological demons. During Melasti, the celebratory build up to Nyepi, “The Day of Silence,” your hosts don ceremonial dress and form a procession to the local temple, where they offer gifts to the gods. And finally, as the New Year dawns on the traditional lunar calendar, you find yourself in a surprisingly dry, but fertile valley watching as the Moon passes before the Sun. Over the years TravelQuest has crisscrossed the globe finding spectacular places to witness total solar eclipses. Our March 2016 journey to Bali, “Island of the Gods,” promises to be one of the most memorable yet. 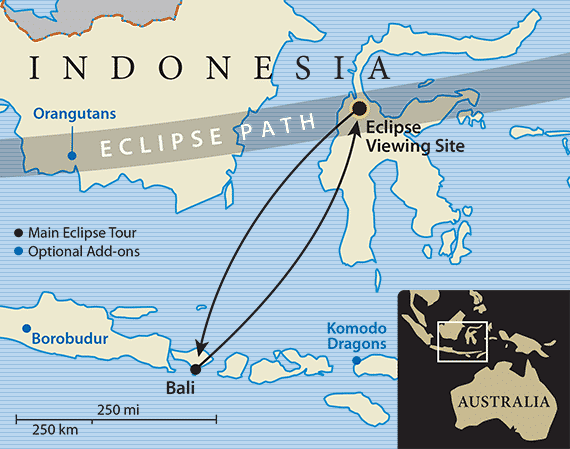 Because while we know our fellow enthusiasts will brave some of the world’s most challenging environments for an amazing eclipse experience, who wouldn’t trade those harsher climes for the exotic, sun-drenched islands of the Indonesian archipelago? For the March 9, 2016, eclipse we’ve found an island whose surroundings provide the ideal site for experiencing 2 minutes and 45 seconds of totality. But while the astronomical event is a focal point for our journey, there are many other dimensions to explore in this amazing part of the world. You can complement your eclipse adventure with a choice of add-on trips: discover the remarkable 8th-century Buddhist monument of Borobudur in East Java; encounter orangutans and proboscis monkeys while getting to know the Dayak people of central Borneo; and visit Komodo National Park on the island of Flores to view the world’s largest lizard, the Komodo Dragon amidst incredible natural beauty.